What do you do when students miss class due to a school trip, sport event, or illness? Typically, you would ask them to catch up on the missed work during their own time. However, this can often be a problem when the assignment is computer-related. Consider the issues before assigning computer homework. If you have been following this thread on the TechnoKids blog you know that I am currently teaching the technology project TechnoEnvironment to a group of middle school students. Today was the fourth and FINAL class scheduled for Internet research. I have had several students away due to school events or illness. These students have not yet completed their research and were told that they must complete their work during Open Lab time or at home. Assigning incomplete work as homework has a unique set of challenges when it is computer-based. 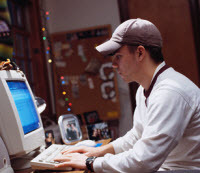 Although, students have access to the computers in the school during Open Lab time, many students prefer to complete their school work at home. This may be because they are involved in clubs or teams during recess or lunch, enjoy playing with their friends during break time, or they like their home computer more than the school’s equipment. This situation caused me to reflect on several issues associated with assigning computer homework. If using a newer version of software at school, teach students how to save the file as an older version for home use. If using a newer version of software at school, send a letter home explaining to parents that they may need to install a compatibility patch on their computers to view files made at school. If students require the file to be opened by a different program at home, teach students how to save the file in a different format. If students have a newer version of software at home, inform them to keep the file in the older file format so they will be able to open it at school. Teach them how to copy and paste files onto a USB drive. Demonstrate how to properly insert and eject the USB drive. Create a sheet for parents that explain how to complete these basics steps in case students need help. Most new virus software will automatically scan a USB drive for viruses when it is inserted. If your school software is older, teach students how to scan their USB drive for viruses manually. Establish a policy that states all USB drives must be scanned for viruses prior to transferring files onto the network. Make sure that students possess the computer skills necessary to complete the task independently. Provide a sheet that summarizes the expectations of the assignment. This will assist parents if they want to supervise the homework. Provide traditional resources they can use for research at home. Encourage students to use Open Lab time.